!Senior Fantasy Baseball Expert Shawn Childs previews every single batter and pitcher on the Atlanta Braves as we approach the 2018 MLB season! Get ready to DOMINATE! The Indians were the best team in baseball in the regular season in 2017. They outscored their opponents by 254 runs thanks to the best ERA (3.30) in baseball. Cleveland gave their fans a magical run late in August when they won 22 straight games. Over the last 37 games of the year, the Indians went 33-4. In August and September, Cleveland scored twice as many runs (309) as their opponents (154). It’s too bad their season ended in the league championship series to the Yankees. The Indians’ offense was 3rd in the AL in runs scored (818), which was 41 more runs than 2016. On the pitching side, Cleveland allowed 112 fewer runs than the previous season (676). In the offseason, the Indians lost 1B Carlos Santana and OF Jay Bruce to free agency. They picked up the option on Michael Brantley while hoping he regains his health. The backend of the bullpen lost Boone Logan, Bryan Shaw, and Joe Smith. Cleveland signed Yonder Alonso to take over first base. Overall, the success of this team comes from the front part of the starting rotation while having two strong options to cover the 8th and 9th inning. The Indians will need to rebuild the rest of the bullpen to bridge the gap from starting to closing. Offensively, Cleveland will be in transition in a couple of lineup spots while relying on the top of the order to gain an edge. Clear favorite again in the AL Central with the pitching staff to drive home a World Series title. Over the first third of the season, Brantley hit .296 with five HRs, 28 RBI, and seven SBs over 206 at bats. This put him on pace for 13 HRs, 75 RBI, and 19 SBs over 550 at bats. His CTBA (.351) fell in line with 2014 (.360) and 2015 (.343) seasons while his average hit (1.485) had less value. Michael missed 13 games in June due to a right ankle issue. Over the next six weeks, he hit .302 with four HRs, 24 RBI, and four SBs over 129 at bats. His ankle issue flared up in early August leading to him missing almost the rest of the season. After the playoffs, Brantley had surgery on his right ankle. His recovery time gives him a chance to be ready by the start of the season. Michael continues to offer an edge in his RBI rate (18) with a low K rate (13.3) and league average walk rate (8.3). Brantley is a nice player, but now has two straight lost seasons due to injuries (right shoulder surgery in 2015 and 2016). The rise in power by Francisco Lindor and Jose Ramirez may push Michael higher in the batting order. Nice balanced skill set with a strong enough approach to hit over .300. I’ll aim low here: 75 runs, 15 HRs, 75 RBI, and 15 SBs with 500 at bats. Ramirez had an amazing season in 2017. He had a massive uptick in his average hit (1.833) while doubling his previous HR/FB rate (14.1 – 6.0 in 2016) leading to a career high in HRs (29). His K rate (10.7) remains in a strong area with some growth in his walk rate (8.1). Jose played well against both righties (.312 with 19 HRs and 52 RBI over 372 at bats) and lefties (.329 with ten HRs and 31 RBI). His bat played well in April (.330 with six HRs and 21 RBI), June (.367 with five HRs and ten RBI), July (.317 with six HRs and 19 RBI), and September (.407 with nine HRs and 21 RBI) with two down months (May – .258 with one HR and five RBI and August – .235 with two HRs and seven RBI). Headed into 2017, Ramirez appeared to have a 15/25 type skill set. There’s no doubt Jose is getting stronger while having a much higher skill set going forward. He’s a .300 hitter with 20/20 skill set at the minimum while offering plus runs and RBI. Lindor led the American League in plate appearances (723) and at bats (651) while setting career highs in double (44), homeruns (33), and RBI (89). His K rate (12.9) and walk rate (8.3) matched his 2016 season in both areas. Francisco had a change in swing path in 2017. His groundball rate (39.2) was much lower than 2015 (50.8) and 2016 (49.2) with a nice jump in his fly ball rate (42.2 – 28.4 in 2016). His HR/FB rate (14.0) was the best of his career, but it was only slightly higher than 2015 (13.0). Lindor hit better vs. lefties (.305 with 11 HRs and 22 RBI over 223 at bats). His season started with a great April (.309 with seven HRs and 17 RBI over 94 at bats) with fade over the next two months (.229 with seven HRs and 21 RBI). His swing started to come around in July (.318) with minimal production (two HRs and 11 RBI). When the Indians made their big push over the last two months of the year, Francisco was a big part of the ride (.279 with 41 runs, 17 HRs, 40 RBI, and nine SBs). Just like Ramirez, his skill set did flip. Speed appeared to be the bigger part of his early skill set, but the change in approach at the plate led to his rise in power. His CTBA (.319) lost value most likely to more easy outs in the outfield on fly balls. His AVH (1.848) was well above his previous resume. Possible trap in power, but his overall skill set should offer an edge in all areas. In 2018, I’d aim for a .280+ batting average with 100+ runs, 20+ HRs, 80+ RBI, and 25+ SBs. It took Encarnacion a late surge in power (17 HRs) and RBI (47) over the last two months of the season to reach his previous success over the last five years. His bat had low value in April (.200 with four HRs and nine RBI over 85 at bats) with low production in May (.263 with six HRs and 13 RBI over 99 at bats). Over the last four months of the year, Edwin hit .270 with 73 runs, 28 HRs, and 87 RBI. HIs K rate (19.9) was his highest in career with a full season of at bats. Encarnacion took the most walks of his career (104 – 15.6 percent walk rate). His CTBA (.340) has been in a tight range over the last three seasons with continued success in his average hit (1.951). He continues to be a fly ball hitter (41.8) with a huge HR/FB rate (21.3). When looking at his career path, he has David Ortiz feel. Great power hitter who lost some of his plate discipline over the last two seasons. Solid floor of 90 runs, 35 HRs, and 100 RBI with a chance that his batting average rebounds. After being a Fantasy donation for most of his career, Alonso finally had a spark in his swing. Prior to the All-Star break, Yonder hit .275 with 20 HRs and 43 RBI over 258 at bats. He struggled vs. lefties (.181 with five HRs and ten RBI over 72 at bats) leading to him being a platoon hitter after he was traded to Seattle. HIs K rate (22.7) was much higher than his career resume (15.9) with a nice spike in his walk rate (13.1). Just like Francisco Lindor, Alonso had a change in his swing path and huge step up in his HR/FB rate (19.4 – 9.2 in his career). HIs FB rate (43.2) was a career high while jumping well above his career average (34.3). At the same time, his ground ball rate (33.9) was much lower than his last two seasons (2015 – 49.2 and 2016 – 44.1). Pretty easy to see than Yonder decided to be more aggressive at the plate while figuring how to put more loft on the ball. His lack of success against lefties points to a platoon role this year. Think of him as a .270 hitter in drafts with a 15/60 type skill set and hope more of his pieces come together in 2018. His rise in CTBA (.360) and AVH (1.883) do paint a higher picture. Kipnis maintained a high AVH (1.782), but he made much weaker contact (CTBA – .294). His K rate (19.0) fell in line with his career average while his walk rate (7.5) regressed for the fourth straight season. Jason missed the first three weeks of the year with a right shoulder injury. He struggled over his first 19 games (.155 with no HRs and six RBI over 71 at bats). Over his next 47 games, Kipnis hit .262 with eight HRs and 20 RBI over 183 at bats. A hamstring issue cost him another seven weeks with two trips to the DL. Over his last 82 at bats, Kipnis hit .232 with four HRs and nine RBI. His swing came up empty too many times against lefties (.207 with three HRs and 14 RBI). Jason did have a career high FB rate (44.1 – 33.1 in his career) while his HR/FB rate (10.1) came in at his career average. The lost of speed was clearly tied to his last of health. I’m torn on the long-term status of his shoulder. His major resume says .270 with 15+ HRs and 20+ SBs. His possible drop back in form could lead to lower spot in the batting order. With a good spring training report, a top of on order opportunity could be waiting for him setting the stage as a possible value pick. In between his battle with injuries, Chisenhall offered productive at bats. Over the first six weeks of the season that included a week’s worth of missed game to start the year with a right shoulder injury, Lonnie hit .254 over 67 at bats with two HRs and 12 RBI in a platoon role. His bat started to heat up over seven games in mid-May (three HRs and six RBI), but a concussion knocked him out of the next two weeks. When he returned to the starting lineup in early June, Chisenhall played at an elite level (.347 with six HRs and 29 RBI over 95 at bats). A calf issue cost him another seven weeks. He lost his way in September (.224 with no HRs, two RBI, and 16 Ks over 49 at bats). Lonnie handled himself well against both lefties (.340 with two HRs and ten RBI over 47 at bats) and righties (.275 with ten HRs and 43 RBI over 189 at bats). His K rate (20.4) was above his career resume (18.8) while setting a career high in his walk rate (9.3). He finished with a career high in his HR/FB rate (14.3) and his FB rate (45.7). Improving bat, but he’s never had 500 at bats in the majors. Cleveland does have young talent developing at the higher levels of the minors, which will hurt Chisenhall ability to play every day. 20/80 skill set with a neutral batting average if given full time at bats. Over five years in the minors, Mejia hit .293 with 40 HRs, 245 RBI, and 18 SBs over 1.498 at bats. He handled himself well at AA in 2017 (.297 with 14 HRs and 52 RBI over 347 at bats). His walk rate (6.8) is below league average with strength in his K rate (15.1). HIs AFH (1.650) is trending upward. With Yan Gomes struggling in the majors in 2017, Francisco could easily steal the starting job early in the season. HIs defense isn’t at major league level, which may restrict his opportunity. Upside C2 in deep leagues are in AL only leagues with batting being his best early asset. Player to follow this spring as his draft could move quickly. Zimmer has an interesting combination of power and speed. In 2015 at between High A and AA, he stole 44 bags over 473 at bats. This really doesn’t match his size (6’5″ and 220 Lbs.). Bradley hit .270 over four seasons in the minors with 42 HRs, 171 RBI, and 103 SBs over 1,246 at bats. His swing for the fences types of approach leads to a high K rate (25.9) with strength in his walk rate (11.4). HIs AVH (1.811) had growth in each season in the minors with flashes in his CTBA (.446 at AAA in 2017). In the majors, Zimmer struck out 29.8 percent of the time with a step back in his walk rate (7.8). He struggled against lefties (.243 with a HR and nine RBI over 74 at bats) and righties (.240 with seven HRs and 30 RBI over 225 at bats) with Cleveland. Over his first 208 at bats in the majors, Bradley hit .284 with eight HRs and 37 RBI, and 13 SBs while striking out 61 times. He suffered a broken bone in his left hand in early September after struggling badly in August (.143 with no HRs, two RBI, five SBs, and 38 Ks over 91 at bats). One of the few players with a 20/40 skill set out of the gate if he doesn’t strike his way out of the starting lineup. Over six years in the minors, Tyler hit .289 with 32 HRs, 177 RBI, and 52 SBs in 1,661 at bats. He struck out 20.8 percent in the minors with a slightly above league average walk rate (9.1). In the majors, his approach at the plate was much weaker (29.9 percent K rate). In 2016 in the majors, Naquin hit .301 vs. RH pitching with 14 HRs and 36 RBI in 289 at bats (105 Ks in 325 plate appearances). The Indians gave him minimal chances against lefties (.250 with no HRs and seven RBI in 32 at bats). His swing was red hot in June and July (.343 with 12 HRs, 30 RBI, and three SBs) while receiving 134 at bats. Pitchers figured him out over the last two months of the season (.234 with two HRs, 11 RBI, and three SBs over 124 at bats). Even with a high HR/FB rate (22.2), Tyler was more of a groundball hitter (46.4 percent). At AAA in 2017, he hit .396 at bats over his first 53 at bats with a HR and five RBI putting on path for a call up to the majors, but a back injury in early May led to six weeks on the DL. Over his last 238 at bats, Tyler hit .281 with nine HRs, 46 RBI, and five SBs. In the mix for a bench role in the majors with enough talent to add value as an injury cover if given a starting job. 20/20 type player with 500+ at bats and better command of the strike zone in the majors. Gomes failed to make better contact (CTBA – .287) for the second straight season (2016 – .231) while continuing to strikeout at high rate (25.9). His AVH (1.722) fell within his resume while taking a career high in walks (8.1 percent). Over his first 64 at bats, Yan hit .219 with a HR and two RBI. He hit .257 over the next five weeks with three HRs and 16 RBI over 70 at bats to make him at least playable as a C2 in deep leagues. More emptiness and lost playing time came over his next 31 games (.198 with two HRs and 13 RBI over 101 at bats). His best value came over the last third of the season (.255 with eight HRs and 26 RBI over 106 at bats) while losing his approach at the plate (three walks and 36 Ks). Gomes was a better hitter against lefties (.245 with eight HRs and 24 RBI over 106 at bats) pointing to a platoon role going forward. Yan has 15/50 skill set with 400+ at bats, but he has a young stud ready to steal his opportunity. Roberto Perez (C) – Roberto will compete for the backup catching job in Cleveland. Over four seasons in the majors, Perez hit .216 with 19 HRs and 80 RBI over 639 at bats. His lack of success will lead to him being passed over as the backup when Francisco Mejia is ready to make it to the majors. Bobby Bradley (1B) – Bobby looks to be the future at first base for the Indians. Over four years in the minors, he hit .261 with 87 HRs, 333 RBI, and 12 SBs over 1,516 at bats. His K rate (27.3) is high while showing the ability to take walk (11.6 percent). This season Bradley will start at AAA after spending 131 games at AA in 2017 (.251 with 23 HRs and 89 RBI over 467 at bats). Giovanny Urshela (3B) – After getting 267 at bats in the majors in 2015 (.225 with six HRs and 21 RBI), Urshela failed to make it to the majors in 2016. Giovanny is a career .269 hitter in the minors with 70 HRs, 402 RBI, and 16 SBs over 3,154 at bats. Last season he hit .224 over 156 at bats with a HR and 15 RBI over 156 at bats with the Indians. He’ll compete for a backend infield job in 2018. Yandy Diaz (3B) – Diaz is a career .315 hitter in the minors with 23 HRs, 184 RBI, and 23 SBs over 1,531 at bats. He’s handled himself at AAA (.331 over 12 HRs, 78 RBI, and six SBs over 688 at bats) over the last three seasons. Last year Yandy hit .263 with Cleveland with no HRs, 13 RBI, and two SBs over 156 at bats. Viable backup infield option with a chance to take over third base in the future with Jose Ramirez moving to second base. Greg Allen (OF) – Gary could be a speed out if he gains starting at bats in the majors. Over 1,481 at bats in the minors, Allen hit .274 with 16 HRs, 134 RBI, and 145 SBs. He has a top of the order walk rate (10.2) while striking out at a low level (12.4 percent). 50+ SBs upside with 500+ at bats. He’ll start the year at AAA. Kluber had his best season in his career in 2017. He led the AL in wins (18), ERA (2.25), shutout (3), walk rate (1.6), and hits per nine innings (6.2). His growth in command led the best K rate (11.7) in his career. Corey could have made a run at 300+ Ks if he didn’t miss a month of the season. Over his last 20 starts of the year, he went 13-2 with a 1.53 ERA and 196 Ks over 147.1 innings. 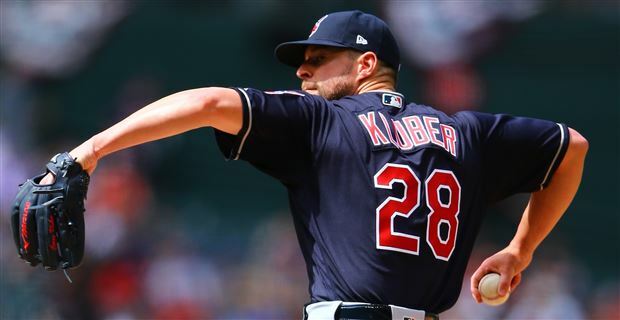 Kluber had double digit Ks in 15 starts, which included a strength of ten games in 11 starts (124 Ks over 83.1 innings). His season started off slow (5.06 ERA over 37.1 innings) due to back injury. His stuff was elite against both RH (.186 BAA) and LH (.200) batters. Corey actually lost velocity on his fastball (93.0). Batters struggled to hit his four-seam fastball (.171 BAA), slider (.112 BAA), and changeup (.125 BAA) with some failure with his cutter (.255 with 11 HRs in 192 at bats) and sinker (.302 BAA). It will be tough to pass on him on draft day as his resume in 2017 is outstanding in all areas. Possible 20+ wins with a sub 3.00 ERA and 275+ Ks. A March elbow issue scared many Fantasy owners away from Carrasco in late March leading to him sliding in drafts. Carlos didn’t miss a start while pitching great over his first seven starts (4-2 with a 1.86 ERA, .177 BAA, and 46 Ks over 48.1 innings). He didn’t look healthy over his next eight starts (5.74 ERA), but Carrasco did have 50 Ks over 42.1 innings. He scared Fantasy owners in mid-May when Carlos left a start early with pectoral issue and one missed start. Over his last 21 starts, he had a 3.25 ERA with 158 Ks over 130.1 innings. Carrasco did have five disaster starts over this period (29 runs and 44 baserunners over 23.2 innings). His best success came against righties (.228). Fourteen of his 21 HRs were allowed to LH batters (.244 BAA) over 336 at bats. Carlos lost velocity on his fastball (94.8) in each of his last three seasons. Batters crushed his four-seam fastball (.345 BAA with a .630 SLG) and sinker (.314 BAA and .505 SLG). He has three elite off-speed pitches (slider – .158 BAA, changeup – .120 BAA, and curveball – .154 BAA). His GB rate (45.2) is trending lower with a rise in line drives (21.7 percent) and in fly balls (33.1). Carlos looks great on paper. His bouts of disaster, his early season battle with an elbow issue, and jump in innings pitched (61.1 including playoffs) may be enough to keep me away in 2018. The talent to deliver a sub 3.00 ERA with better location of his fastball in the strike zone and 200+ Ks. Danny pitched his way out of the starting rotation after ten starts when he posted a 5.50 ERA, 1.586 WHIP, and 11 HRs over 52.1 innings. After two relief outings in June, Salazar landed on the DL for six weeks with right shoulder injury. His stuff looked electric over five starts (1.39 ERA over 32.1 innings with 46 Ks) when he returned to the starting rotation in late July. A disaster outing on August 20th (six runs and 13 baserunners over 4.2 innings) led to a second trip on the DL with a right elbow issue. Danny had a 4.09 ERA with 17 Ks over his last 11 innings of the year. HIs K rate (12.7) was a career high, but he struggled with walks (3.8 per nine innings) for the second straight season. Righties hit .230 vs. Salazar with some struggles against LH batters (.257 BAA). His AFB (95.6) was in line with his last four years. Batters drilled his sinker (.431 BAA and .778 SLG) while his changeup (.161 BAA) and slider (.130 BAA) remained elite. Danny threw a few more changeup in 2017 at the expense of his fastball. In the end, health was clearly the reason for his failure. Salazar has plenty of K ability with more upside if he throws more strikes. A shoulder injury paired with an elbow issue is a bad combination when deciding on his value on draft day. Upside: CY Young winner with an elite ERA and 200+ Ks. Downside: TJ surgery. Bauer now has a 47-41 record in the majors, but he still hasn’t posted an ERA under 4.00 in his major league career. In 2017, his walk rate (3.1) was the best of his career with two straight seasons of improvement. This led to an uptick in his K rate (10.0) and a career high in strikeouts (196). Even better command, Trevor served up more homeruns (25 – 1.3 per nine innings) while being easier to hit (.266 BAA – .250 BAA in his career). Most of his failure came against lefties (.276 with 16 HRs over 319 at bats). Bauer has yet to pitch over 190 innings in a season due to his high pitch count early in many starts. Over his first 18 starts, Trevor has a 5.59 ERA despite allowing more than four runs in just two starts. His game started to make a nice step forward on July 27th. Over his last 13 games, he went 9-1 with a 2.42 ERA and 85 Ks over 78 innings. Best of all was his improved K rate (2.2). His AFB (94.4) was just below 2016 (94.6). Batters actually has success against 55.8 percent of his pitches (four-seam fastball – .292 BAA over 1372 pitches, sinker – .302 BAA over 348 pitches, and changeup – .353 BAA over 217 pitches). Of these pitches, his four-seam fastball showed the most growth over his last 13 games (.273 BAA). Trevor gets batters out with his plus curveball (.225 BAA – 1022 chances), low volume slider (.195 BAA – 186 pitches), and show me split finger fastball (.071 BAA – only 54 pitches in 2017). Trending forward to the points that he may finally offer some help in ERA and WHIP. Trevor needs to throw more strikes with better location of his fast ball within the strike zone. His growth over the last two months of the season points to a sub 3.50 ERA with 225+ with 200 innings pitches. His one black mark in 2017 that needs to be address before he can become elite is his low first strike rate (56.8). The injuries to Corey Kluber and Danny Salazar over the first half of 2017 lead to Clevinger being a nice waiver wire arm. His season started with five great starts at AAA (five runs over 30 innings with 33 Ks). Mike has hot and cold over his first seven games in the majors (4.09 ERA with 38 Ks over 33 innings) due to poor command (17 walks and five HRs). He made a step forward over his next five starts (1.36 ERA, .161 BAA, and 35 Ks over 33 innings), but two disaster starts (ten runs and 22 baserunners over 7.1 innings) gave away his gains while leaving Fantasy owners in a quandary of his value and opportunity going forward. Over the last seven weeks of the year, Clevinger made seven starts and four relief appearances leading to a 7-2 record with a 1.71 ERA and 56 Ks over 47.1 innings. Over this span, he did lose his command (20 walks – 3.8 per nine). On the year, Mike finishes with nice ERA (3.11) and plus K rate (10.1), but he did walk too many batters (4.4 per nine innings). Batters only hit .211 against him while dominating righties (.180 BAA). Surprisingly, Clevinger was a much better pitcher on the road (2.45 ERA with only 40 hits allowed over 62.1 innings). His AFB (92.8) came in below league average with less velocity than 2016 (94.5). All three of his secondary pitches played well (slider – .099 BAA, changeup – .228 BAA, and curveball – .177 BAA). Over seven seasons in the minors, Mike went 28-17 with a 3.35 ERA and 424 Ks over 435.1 innings while showing better command (3.1 percent walk rate). His dominance at AAA over 24 starts (14-3 with a 2.91 ERA and 135 Ks over 127 innings) tells me last year wasn’t a fluke. I expect him to win the 5th starting job in March, but he needs to throw more strikes at the major league level. His ERA should drift backward with some WHIP risk early in his career. With 30 starts, 175 Ks with a sub 3.75 ERA and double-digit wins. Over the last three seasons with Indians, Tomlin went 30-20 with a 4.37 ERA and 284 Ks over 380.2 innings. His best asset is his command (1.3 walks per nine in his career), but he does allow too many HRs (1.5 per nine in his career). His K rate (7.0) was above his career average (6.1) for the third time in four years. Josh had a tough time with both RH (.284 BAA) and LH (.307) batters in 2017. He struggled over his first five starts (8.87 ERA and .369 BAA) before showing a spark over two games (two runs over 15 innings with ten Ks). Tomlin was a losing option over his next nine starts (6.42 ERA and .340 BAA). Somehow, he became relevant over his last ten starts (3.11 ERA over 55 innings with 45 Ks), but he did miss the month of August with a hamstring issue. His AFB (87.9) was the lowest of his career. Batters had success against his four-seam fastball (.313 BAA) and cutter (.305 BAA). His out pitch was his curveball (.233 BAA) followed by a show me changeup (.222 BAA). Tough buy on draft day due to his disaster downside when he’s running off the tracks. More of a waiver wire flier with a start to start reevaluation. His command gives him a chance of having short runs of success. Only an inning eater with more risk than reward at this point of his career. The Indians drafted McKenzie in the first round (42nd pick) in the 2015 MLB June Amatuer Draft. Cleveland gave him a full workload at High A in 2017 and he responded with a nice season (12-6 with a 3.46 ERA and 186 Ks over 143 innings). Triston still needs to add bulk and strength to help him with a full major league workload. His fastball has mid-90s life with more velocity expected as he fills out. McKenzie has a plus curveball with strikeout ability while developing the feel for his changeup. This season he’ll start the year at AA with a quick push to AAA giving him a chance at the majors by 2019 at the latest. Must follow this spring as his game could come quicker than expected especially if the Indians had an injury to one of their top arms. Allen has a nice ERA (2.67) and high K rate (11.7) over six seasons with Cleveland, but he’s yet to deliver impact saves (34, 32, and 30 over the last three years). In 2017, Cody had the best walk rate (2.8) of his career. He threw the ball great over his first 18.2 innings (1.45 ERA and .229 BAA) while earning 13 successful saves by May 23rd. Over the next ten weeks, Cody looked to be pitching himself out of the 9th inning (4.74 ERA with two blown saves in eight chances). A 16.2 inning scoreless run with nine saves pushed his ERA (2.47) back in a favorable area. Over his next four games, Allen allowed five runs and nine baserunners over three innings. He allowed eight of his nine HRs to RH batter (.230 BAA) while pitching well vs. lefties (.209 BAA). HIs AFB (94.6) was a career low with three straight seasons of regression. All ten of his homeruns allowed came off his fastball. His only other pitch is a plus curveball (.174 BAA). Cody is a fly ball pitcher (46.3 percent in 2017 – 43.0 in his career) with a raising HR/FB rate (15.1 in 2016 and 11.8 in 2017). His lack of saves in 2017 was due to Cleveland scoring a ton of runs over the last two months of the season. I’d like to see more strikes earlier in the count to help push him over the 100 K mark. Nice closer, but he won’t be on must get list due to lack of saves and expected draft value. Miller remains the best arm in the Indians’ bullpen. Over the last four seasons, he has a 22-11 record with a 1.72 ERA , 421 Ks, and 51 saves over 261 innings. Last season he looked to be on the verge of stealing the 9th job after allowing just one run over his first 32 innings with 48 Ks. Andrew then struggled in back-to-back games (five runs, six baserunners, and two HRs over 2.1 innings). Miller pitched well over his next 17 games (1.77 ERA and 1.18 BAA), but a right knee injury cost him almost all of the next six weeks. When he returned to health over the last half of September, Miller didn’t allow a run over eight innings with 16 Ks. His stuff graded well vs. righties (.136 BAA) and lefties (.164 BAA). Andrew lost some life on his fastball (94.5) with batters hitting .245 against it (.165 in 2016). His slider (.099 BAA) remains one of the best pitches in the majors. Great arm that belongs on the 9th inning. For now, 100+ Ks with an edge in ERA and WHIP plus the chance to pick up some vulture wins. After struggling in the starting rotation in 2014 (5.67 ERA and 1.493 WHIP), Cleveland shifted McAllister to the bullpen. He allowed four runs over 13 innings with two walks and 14 Ks to close out the year. Over 168 games in his career in relief, Zach has a 2.71 ERA with 210 Ks over 189.1 innings. With Bryan Shaw no longer on the roster, he appears to be the top option to pitch in the seventh inning. His AFB (95.8) is tough to hit (.241 BAA) while offering a plus curveball (.206 BAA). Zach need to cut down the homeruns allowed (1.2 per nine in 2017). His first pitch strike rate (64.4) was the best of his career last season. No real closing upside at this point of his career.